Rob Bell made his name as a controversial evangelical pastor. His books Velvet Elvis and Love Wins brought unique perspectives to traditional Christian doctrines, causing quite a bit of backlash in the process. Bell’s career has evolved from pastoring a large church to giving talks about spirituality to developing a television talk show and now a podcast. With How to Be Here he is moving into the role of self-help author (more or less). The book deals primarily with the issues of creativity and work. Bell builds his ideas about a creative and fulfilling approach to work on the Japanese word ikigai. According to Bell, “Your ikigai is that sense you have when you wake up that this day matters, that there are new experiences to be had, that you have work to do, a contribution to make” (56). This idea is meant to encourage readers to take risks in pursuing creative projects and to inject a sense of meaning in the most mundane jobs. “Success says, What more can I get? Bell’s writing tends toward a kind of superficial, positive-thinking message. That said, he can also convey significant ideas with clarity and inspiration. 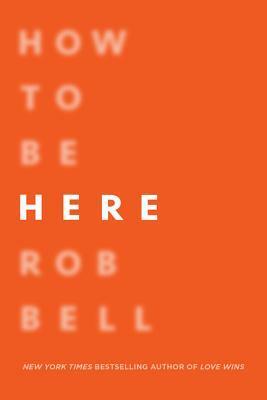 How to Be Here is an easy read that may give you a different perspective on your work, your goals, and the motivation behind them. Worth picking up. After You is the sequel to Me Before You. After having her life transformed from taking care of Will Traynor in Me Before You, Louisa Clark trying to move on with her life in After You. Following a terrible accident she is forced to move back in with her parents. As her body is healing she realizes that she is also in need of emotional healing. She starts attending a support group where she can share her struggles and also comes to understand that she is not alone in her suffering. It is through this support group that she meets Sam Fielding, a paramedic. Just as he is helping her gain her strength back, emotionally and physically, someone from Will’s past unexpectedly shows up on her door step and, once again, her life has a sudden change of plans. Jojo Moyes brings together two families who each have their own struggles and joys, yet they are able to come together to support one another. I decided to listen to the audio recording of After You and I think I made a wise choice. Anna Acton’s clear British enunciation and charmingly self-deprecating asides will make you happy to be back in the world Jojo Moyes created. Her voice is so mesmerizing that she brought the book to life and it was easy to get lost in the story. After You made me laugh and cry and even sometimes both at the same time. I don’t think I would have taken so much away from this book if I had read it on my own. It is lovely, frustrating, heartbreaking, and emotionally charged. Overall, I enjoyed this story and I think it is worth the read, or maybe better yet, a listen. Harry Potter and the Cursed Child is a play script based on an original story by J.K. Rowling, John Tiffany, and Jack Thorne. According to the back of the book jacket, Harry Potter and the Cursed Child is the 8th story and takes place 19 years later. The story focuses on Harry Potter’s son, Albus Severus Potter, and Draco Malfoy’s son, Scorpius Malfoy. Albus and Scorpius are best friends who feel the pressure of being the sons of Harry and Draco. They share an adventure that involves time travel, danger, and characters from the earlier Harry Potter books. Harry Potter and the Cursed Child tells an interesting story. It is a short read. It is not the lengthy, description filled novel that we know from the first 7 books. As I was reading, I had to remind myself that this is a play. It probably can’t stand alone if you didn’t read at least some of the earlier books. I’m glad that I read Harry Potter and the Cursed Child. It would be fun to see the play.